Confession time—I love the Olympic Games. Watching all those amazing athletes compete really floats my boat. From water polo to beach volley ball, badminton to the marathon, diving to rowing, I enjoy it all (except that abomination known in the US as soccer, but that’s a rant for another day). I think of the marathon as the quintessential Olympic event. I remember a barefoot Abibi Bikila winning the gold in Rome, a shod Bikila repeating in Mexico City. Absolutely amazing. But my favorite Olympic sport to watch is gymnastics, both the women and the men. Last night I was watching the women compete for individual medals and saw Alicia Sacramone get robbed of the bronze medal in the vault. I really wanted her to win an individual medal because of the courage and determination she showed during the team competition. In the balance beam competition, Sacramone fell off the beam on her difficult mount. She could have simply given up and gone through the motions of finishing her routine. I’ve seen many a gymnast do just that. But not Alicia. She got back on the beam and nailed the rest of her routine. I mean she absolutely nailed it. I cannot help but admire that sort of determination. Giving up is sometimes tempting but rarely satisfying. Don’t get me wrong. I know that there are times when giving up is the wise thing to do, the right thing to do. But Alicia knew what was at stake. Her team was depending on her, her pride and hard work were on the line, and the whole world was watching. And Alicia came through. The story of Alicia, and of all the other Olympic competitors who didn’t give up, are inspirational, even to a knitter. During the games, I was working on the second of the Celtic Spirit socks I made for cousin Vickie. I was just about to start the toe decreases when I held the second sock up to the first to make sure the foot was the proper length. Uh-oh. The leg of sock #2 was shorter than the leg of sock #1. I had left out an entire repeat of the 24-row cable pattern. Duh! To the frog pond I went. Out came the needles. I ripped and ripped and ripped, picked up the stitches, finished the leg, turned the heel, and knit the foot again. Once again I was ready to do the toe decreases. Uh-oh. I was four stitches short. I had done too many gusset decreases. Damn! Back to the frog pond. Rip-it! Rip-it! Rip-it! Knit it again. I’m glad to report that Misti Alpaca laceweight holds up well to repeated ripping and reknitting. 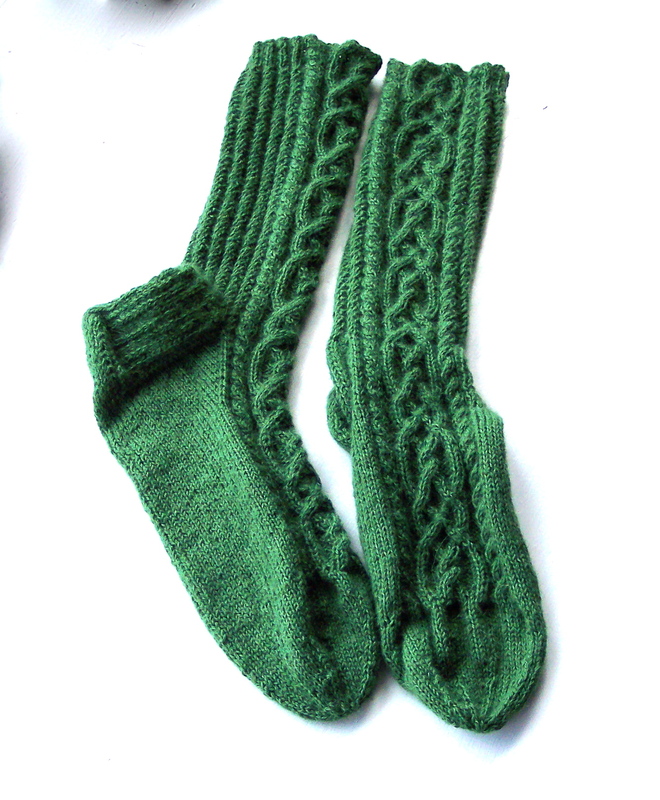 LOL Anyway, the socks, pictured above, are finished and were worth the effort to do them right, don’t you agree? I know that cousin Vickie will love them.